“BLESSED THE MAN WHO FEARS THE LORD” (Ps 112:1b) – Welcome to Fr. JohnBosco's Blog! Remember that we already saw that love could be a veritable instrument of fostering unity. Now, the evangelist John goes ahead to encourage the early Christians on the importance of showing hospitality to strangers, especially the missionaries who have left everything for the sake of the Gospel (cf. 3 John 5-8). In doing that, we would once more be assisting Christ indirectly in line with the demands for the kingdom of God (cf. Matt 25:34-46). Moreover, the Lord Jesus himself says that, anyone who gives a cup of cold water to one of these little ones because he is a disciple of mine would not go unrewarded (Matt 10:42). As we know, every good thing we do finds its perfection in God. Our call to assist those in need should serve to encourage and remind us that God would always assist us in times of our need. Hence, the Gospel calls on us to trust in Divine Providence and wait on it without losing hope (cf. Luke 18:1-8). 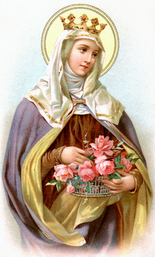 St. Elizabeth of Hungary was a woman born with worldly affluence and had everything going well for him in life. But she was able to discover that all those things are perishable, and so she dedicated her life to works of charity so that she can prepare for herself, a place in Christ. Can you see? All you need to do is to walk in the fear of the Lord by keeping his commands, living in love and trusting in God wholeheartedly. With this, there is surely nothing you shall lack because, God the great provider, would provide whatever you need as he enriched the life of St. Elizabeth with miraculous signs. May God give us the grace to fulfill all that is needed of us and supply in us whatever we we need. Amen. Have a lovely and fulfilling weekend. Peace be with you. Next story IN THE END, WE SHALL BE VICTORIOUS!